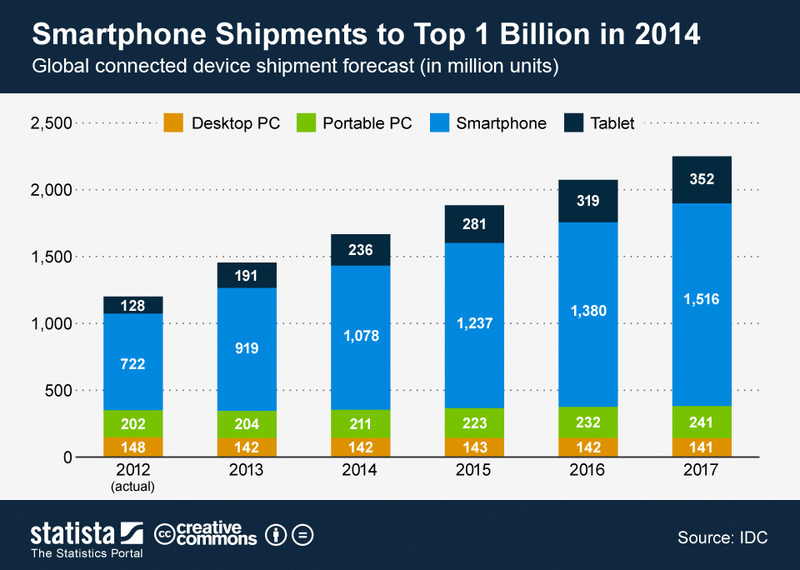 According to recent market studies by marketing research firm IDC, by the year 2014 smartphone shipments are projected to surpass 1 BILLION for the first time ever! This is just another astounding number in a long list of statistics that illustrate the recent smartphone and mobile device explosion. It is pretty apparent that the mobile market is larger than ever before, but a majority of people, and businesses, are still not fully aware of the sheer vastness of the entire mobile market and the opportunities it presents. Here is a list of mobile marketing statistics 2014 list that will assuredly shock and surprise you and hopefully open your eyes and mind to something you were not aware of before. Apple and Android make up over 75% of the smartphone market. 30% of American consumers use mobile devices for shopping. 80% of physicians use their mobile devices while they are at work. If your mobile site isn’t working correctly, 46% of those who visited your site will NEVER return again. 1 in 4 mobile users will redeem a coupon via a mobile device by 2014. 4% of American tablet owners use their tablets to shop 2-3 times a month. This year alone, mobile commerce will make up 15% of ALL eCommerce sales. Mobile advertising revenue is projected to increase from $9 billion last year to $11 billion this year. American mobile marketing will reach over $7 billion in 2013, and Google will take home over half of it.